Mitsubishi Chemical Corporation Pioneer Corporation have developed a color-tunable and dimmable OLED lighting panel produced using Mitsubishi's wet-coating process. The companies say that this panel can be produced for less than one-third of the cost of OLEDs made with regular evaporation-based production methods. Mitsubishi and Pioneer say that these panels will be mass produced in early 2016. They will make three panels, the OLE-P0505 (55x55 mm, active area 40x35 mm), the OLE-P0707 (69x69 mm, active area 54x51 mm) and the OLE-P0909 (92x92 mm, active area 76x76 mm). All three panels are 1.08 mm thick and feature a max luminance of 2,000 cd/m2 and a color temperature of 3000K to 5000K. The panels will be distributed by MC Pioneer OLED Lighting Corporation. Konica Minolta brought their color-tunable flexible OLEDs to L+B 2014, and now the company posted this video showing these new panels. The exhibition (which KM calls the Cradle Of Life) shows three design concepts by Takram design engineering. In the video you can see the rotating Irodori uses a layered spiral design that resembles peacock features, the small Ibuki uses two light-weight panels that seem to float in the air and the Habataki 2.0 seems like a bird fledgling leaving the nest. Konica Minolta announced that it is starting to construct an OLED lighting fab at Konica Minolta Kofu Site (Chuo-shi, Yamanashi Prefecture). This fab will mass produce flexible OLED lighting panels (on plastic substrates). The construction will end in the summer of 2014 and mass production will commence in the fall of 2014. Konica Minolta says that it reached the conclusion that light, bendable and durable OLED lighting panels on plastic substrates will "deliver new values to customers not only in general lighting and architecture sectors but also in electric appliances and automobile sector". Konica will invest ¥10 billion (almost $100 million) in the new fab. Konica Minolta announced that they will show flexible OLED "demonstration models" at the Light + Building 2014 Frankfurt trade show next month. KM says that not only are these the thinnest OLEDs ever on display, but the panels will also be color tunable, making them the first color-tunable flexible OLEDs in the world. In the image above, you can see the three models Konica Minolta will have on display. From left to right: the Irodori (with color-tunable OLEDs) which rotates slowly, the Ibuki - a couple of those world's thinnest 70-micron OLED panels that seem to float in the air, and finally the Habtaki 2.0, which gives an impression of a bird fledgling leaving the nest. In July 2012 the COMEDD was established as an independent institute at Fraunhofer (previously it was a department at the Fraunhofer IPMS). In April 2013 they held the opening ceremony. Since then they announced several new OLED technologies which I'll update on below. Fraunhofer's COMEDD developed new color tunable OLED lighting panels. These new panels will be presented at the LOPE-C 2013 exhibition (June 11) for the first time. 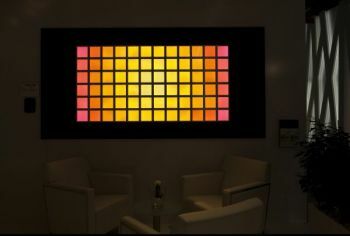 To develop these new panels, the Fraunhofer used vertical stacking of OLED emitters which can be controlled separately. They say that by using different process technology, COMEDD was able to achieve the right stack architecture including the optimized thickness of the individual OLEDs for an appropriate efficacy. 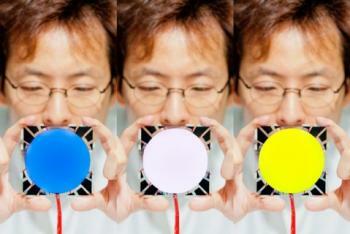 Back in March 2012 we posted an update on Sumitomo's OLED program. According to the company's roadmap, by 2015 they plan to produce PLEDs on plastic substraces which will feature between 20,000 and 30,000 hours of lifetime and 60-80 lm/W. These plastic based OLEDs will also be flexible. Verbatim started shipping the Velve OLED lighting evaluation kit back in May 2011, and last month they sent us a unit for review. This is the world's first (and only) color-tunable OLED lighting panel, and it's pretty exciting. These panels are Verbatim's 2nd-Generation panels, which are twice as bright than the original panels at 2,000 cd/m². The company offers two panel sizes: 131x44 mm and 65x72 mm. Verbatim can also create custom-made OLED panel sizes, and indeed in the video you can spot three different sizes. The Velve OLED lighting panels are made together by Mitsubishi and Pioneer, and are the world's only color-tunable OLED lighting panels. Verbatim started shipping the first color tunable Velve panels back in April 2011, and now the company is presenting their 2nd-Generation panels and modules - which are twice as bright at 2,000 cd/m². The company offers two panel sizes (although Verbatim can also create custom-made OLED panel sizes): 131x44 mm and 65x72 mm. The depth is just 5 mm. The profile of the modules is smaller, thinner and lighter because the printed circuit board is no longer rear-mounted and is housed in an electronic control unit connected via cabling.